Natali Fuller is our Business Development Representative. She has 7 years experience in the communications field with a background in public relations and marketing. She brings energy and enthusiasm with her and is focused on building a solid community relations partnership with Frisco and The Colony. She is a member of Kiwanis Club of Frisco, Frisco Chamber of Commerce, The Colony Chamber of Commerce, and World Affairs Council of Dallas. She enjoys salsa dancing, cooking and working out in her spare time. Jen Young is the Office Manager. She joins our team with 18+ years experience in the healthcare industry. She comes well equipped with respected attributes and skills. Jen applies these skills to make an impact in the restoration industry, community, and customers we serve. 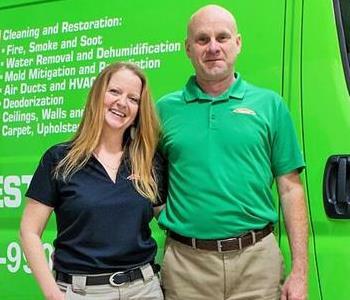 She has successfully completed SERVPRO's ECTP program and is IICRC-WRT certified. In her spare time she loves spending time with her family. She is a proud mother of a son, a step-son, a step-daughter, and kitty-cat. Jason Ronning is a Production Manager at SERVPRO of South Frisco/The Colony. He joins us with 15+ years in the restoration industry and has the following certifications in IICRC-Water Damage Restoration, Carpet Cleaning, and Fire & Smoke Restoration and Lead Renovator. Jason has knowledge in Xactimate and Project Management. In his spare time he enjoys spending time with his beautiful wife and cats.